All the characteristics of a purple Welsh natural slate with all the advantages of a modern building material. Our ongoing commitment means we’re always striving to improve our products. The GRC Welsh purple is no exception with it’s new deeper richer colour being more representative of a natural purple Welsh slate. 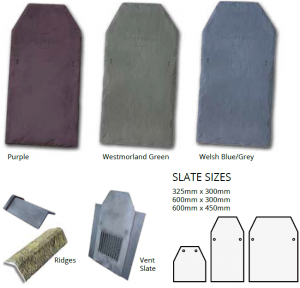 Rilco reproduction slates provide a cost effective alternative, with a combination of an easy to lay format, the Welsh Purple slate delivers a significant saving on time and labour costs.